The Mediterranean Diet is one of the healthiest diets in the world. And, the Greek island of Crete is a great place to explore this traditional, healthy diet. The unique climate of Crete allows everything to grow in abundance. Wherever you travel in Crete, you are surrounded by olive trees. Cretans consume the most olive oil of anybody in the world. This is one of the keys to their extremely healthy way of life. The Cretan diet consists of lots of olive oil, vegetables, fruits, whole grains, and small amounts of meat and fish. Cretans also consume moderate amounts of wine and Raki, the local aperitif. They cook everything in olive oil and they hardly use butter. Butter is used for certain dishes and special occasions like rice pilaf. Could this way of eating explain why Cretans have some of the lowest rate of heart disease in the world? This is certainly part of it. 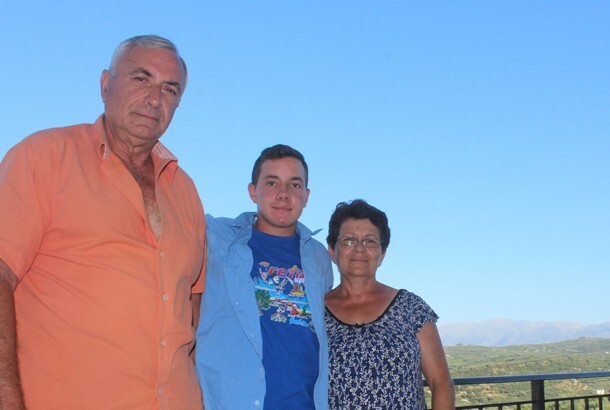 I am lucky enough to spend time in a small village in northwestern Crete with my aunt and uncle who have lived on Crete their entire lives. They truly live the traditional Cretan way of life. They live almost completely off of the land. They grow hundreds of olive trees and produce some of the best olive oil I’ve ever tasted. Going to the orange and nectarine trees with my uncle for the first time was an experience to never forget. It doesn’t get any better than picking the massive oranges off the trees and eating them right there. When you open the orange, the juice literally rains out of it. It tastes like candy! My aunt and uncle also grow any other fruit and vegetable you can think of, because everything grows under the Aegean sun with the perfect climate of Crete. They have lemons, watermelon, cantaloupe, tomatoes, cucumbers, peppers, green beans, zucchini, eggplant, potatoes, onions, garlic, spinach, and artichokes just to name some of their crops. They also grow all of the herbs they need for cooking. When they cook, they are cooking absolutely everything in their own olive oil, with salt that they get from a friend who harvests it from the sea a few kilometers away from their house. Not only do they grow their own vegetables, but they have their own animals as well. The only eggs we eat are from their chickens. The cheese we eat every day is made weekly by my aunt who milks “Lu Lu”, the goat. She then makes the creamiest goat cheese you’ve ever tasted. The goat is fed wild greens that grow in the olive vineyards. My uncle goes into the vineyards every day to chop fresh greens for “Lu Lu” and her little lambs. The chickens eat feed and vegetable scraps leftover from preparing the salad. These animals live happy and healthy lives. This really makes a difference in the taste and quality of the food they produce. A typical meal happens at around 2 to 3 o’ clock in the afternoon. My aunt has been cooking all morning and tending to the animals, and my uncle working in the fields and gardens. When you sit down at the table, it’s always a feast. It’s like a Greek thanksgiving every day here in Crete. 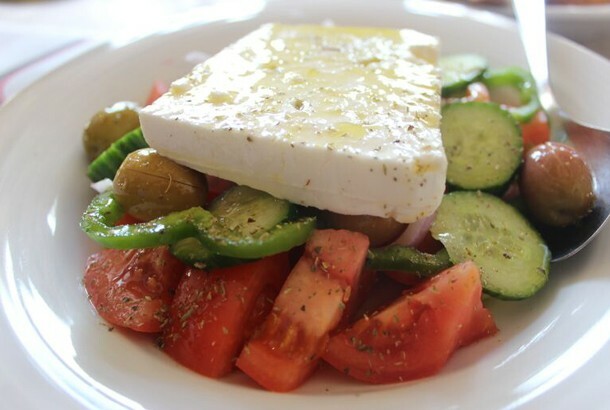 There is always a Greek salad, which can vary depending on what is fresh. If there is a certain herb or green in season, it will be in the salad. There is always a loaf of crusty bread on the table, and if you don’t eat bread, they will ask you what’s wrong. In Greece, eating bread at every meal is a staple. There are two to three small dishes filled with their own olives of different colors, and sizes. There is also a dish filled with the fresh goat cheese made in the previous few days. There is always a bottle of red wine on the table, which is from the barrel down in the basement. The grapes are grown about half a mile from the house. Cretans are very proud of their wine and my uncle likes to flaunt it at every meal, saying just how good his wine is. I agree with him, it really is amazing, especially with all of this delicious food! Most of the main course meals are vegetable based. Meat or fish is a once-a-week thing. Some delicious dishes that my aunt cooks are fresh artichokes, peas, carrots, and potatoes, stewed with lots of lemon, herbs, and olive oil. Another great example is the stuffed vegetables of all sorts, called “Yemista”, which literally means stuffed. The filling is a mixture of rice, tomatoes, onion, herbs, and olive oil. She stuffs tomatoes, zucchini, eggplants, peppers, grape leaves, and even the zucchini flowers. This just goes to show that nothing goes to waste. There is a dish called “Horta”, which Cretans love to eat. Horta are boiled greens that are picked in the wild, or grown in the garden. Depending on the time of the year, there is a different wild green to be picked, but they are all called “Horta” when cooked. My uncle goes to pick the wild greens in the olive fields, and then my aunt washes them thoroughly. They are boiled along with some potatoes and zucchini. When they are served, she adds lots of olive oil, salt, and fresh lemon juice. This is an extremely healthy dish that is packed with nutrients and vitamins. When you are eating in Crete, and you think you’re full, you’re not actually full. You just think you are. There are two reasons for this. The first is that the food tastes so good that you have to keep eating until you’re bursting at the seams. The second is, if you try to stop eating, and tell the cook that you’re full, she will just spoon some more food on your plate. The same goes for the wine. If I try to say I’m done drinking the wine, my uncle just pours me another glass, it’s useless. After all of this eating and drinking, the Greek “siesta” is tradition that is alive and well. Every day there is a nap from around 4 until 7 o’clock. When you wake up from the nap feeling refreshed, it’s customary to drink a Greek coffee. In the summer, my aunt will cut up a fresh watermelon, or cantaloupe from the garden to eat with the coffee. Sipping the coffee and eating the sweet melon, while looking out at the rolling hills of olive trees, and the massive mountain range behind that, I can’t help but be amazed at the lifestyle here in Crete.